Game tied, top of the 9th. What would you do if you were (relief pitcher) Carlos Marmol? Now that I’m getting into the swing of my Major League baseball park tour, I’ve come up with a new guideline that I’ll try to follow for future park visits: time and money permitting, I’ll go to two games and sit in a different section each time. Recent trips to Toronto and now Cincinnati confirm that every park needs a second chance. In both cases, the second visit was a much more enjoyable experience than the first. In Toronto, sitting once under the reverberating dome and a second time under the big blue sky made all the difference. In Cinci, my first game was not only a crushing loss by the Cubs (2-10) but a drenching experience, sitting in the pouring rain. Not fun. It was enough to make us wonder how in the heck we ever thought driving eight hours to see a game was a good idea. Of course, it was a great idea and we had a lot of fun. Day two, sitting in the bleachers in the sun with thousands of other Cubs fans watching our team win was a good time. What a difference a day makes. The ballpark: Great American Ball Park is modern and industrial looking, all concrete and white metal. The style struck me as fairly generic, without much local color beyond the Las Vegas style riverboat that’s permanently grounded in the outfield. The park is open air, which is a plus and right on the river, another plus. Sitting in the bleachers and the upper deck can give you a view of the river and Roebling Bridge. It’s also located near downtown, which I consider another plus, especially for someone from out of town who’s interested in strolling around and perhaps grabbing a bite to eat before the game. JumboTron: Yeah, they’ve got one and it’s a biggie, cluttered up with billboards. Yet another park that makes it hard for fans to follow what’s going on in other games around the country. Sound level: As an open air stadium, the sound level wasn’t too terrible. Sitting in the bleachers was a bit worse, since we were sitting much closer to a speaker. Home run gimmick: When the Reds hit a home run, fireworks shoot out of the riverboat smokestacks. When their pitcher strikes out a batter, the stacks (officially known as the Pepsi Power Stacks–ugh) start smokin’. Food: I always go for the regional option, if there is one, including local microbrews if available. In this case, the local take on the baseball dog was Skyline Chili’s Cheese Coney hotdog. The chili has a hint of cinnamon and the combo was very tasty. The food options in general were quite varied (including a recommended local ice cream, which I didn’t try) and our new favorite, Funachos! The standard hot dog, which I ate the first day in the rain, included toppings of peppers and onions, which were good, but the dog and bun itself was just fair. Local fans: Folks rooting for the home team were friendly and enthusiastic. As I mentioned before, they were far outnumbered by Cubs fans, which was probably as much a testament to their team’s poor record as it was to the loyalty of Cubs fans on the road. You can see more photos from my trip to Great American Ball Park here. BTW, I was disappointed to learn the park is named after an insurance company and not, as I’d naively believed, out of patriotic pride. Second-to-the-last game of the regular season. Cubs win in another nailbiter. Cubs Win! Oh Man Do They Ever Win! Today the Cubs clinched the Central Division Championship, a win made all the sweeter because it was against their arch rivals The Cardinals in front of an ecstatic home crowd. Wish I’d been there. 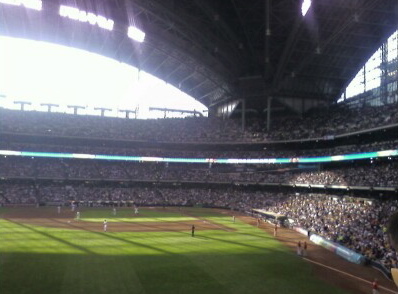 I’ll be there next Saturday, tailgating and cheering the team on at the second-to-last game of the regular season, up at Miller Park in Milwaukee. So, one hurdle down. Two more to go. I’m clearing my October schedule, cause the Cubs are going all the way! Last night was another heart-breaker at Wrigley Field. It was a beautiful night and we had a great time, but the game itself wasn’t much fun. The Cubs sure didn’t give us much to cheer about. At this rate, I’m convinced any game I attend when Ted Lilly is on the mound, the Cubs are sure to lose. Yes, I’m just that superstitious. I hope Lilly’s not pitching at any of the Cincinnati or Milwaukee games I’m going to in September. The highlight of last night’s game was the russet-colored moon rising up over Lake Michigan and above right field during the final inning. We also noticed that outfielder Kosuke Fukudome has a ritual–hopping over second base on his way out to right field each time the Cubs take the field. These photos of “Wrigley Field” are from a trip to the model train garden at the Chicago Botanic Garden Wee-J and I took in June. They had rustic models of many famous buildings which were quite clever. The game (the second of three against the visiting Cardinals) was fun to watch for about half an hour. Cubs lose, 3-12. I forgot to mention that you can see the entire set of photos from my day at Wrigley Field here. Yesterday’s game was a true test of any Cubs fan’s stamina. As you watch, please note the score at the time this was shot. The crowd was flying high. Unfortunately, a disastrous ninth inning allowed the Giants to tie the game up. I have never heard it so quiet at Wrigley field as it was during the second half of the ninth. Stunned silence. It was truly amazing. It took two more innings for the Cubs to win it. The classic Cubs roller coaster ride. Judging from the number of hot dog carts populating the sidewalk outside Rogers Centre and the long lines of people waiting to chow down before the game, we suspected that the ballpark hot dogs were going to be pretty awful. And they were. So this time, we knew better and stopped for our requisite baseball hot dog outside the park. It was a thousand times better and, no surprise, cheaper. The selection of condiments was much more interesting, including a few of regional options I’d not seen before: green olives, sauteed red peppers and corn relish. Hooray, the dome was open though the view wasn’t much better. It feels like you’re sitting in a giant concrete bowl. Jim Edmonds on the field turf quilt. The field security looks a little more intimidating here than at Wrigley. 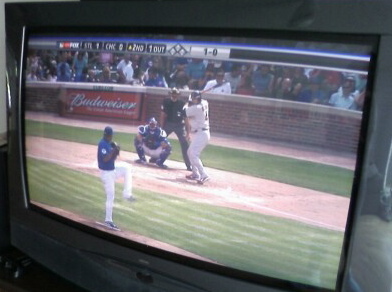 Carlos Marmol on the mound. This one’s for Karen. The lanky Bobby Howry closes the game down.